[By Nick] Are you all done reading part 1 of my Summer Fancy Food Show experience? Good, now it's time for part two. All these brands were on the bottom floor of the convention. This part of the show was based on states throughout the country with some foreign companies towards the back like our friends up north, Canada. First stop was Batch from Dubba's state of Massachusetts. Dubba has reviewed them once before for the site but nothing recently. 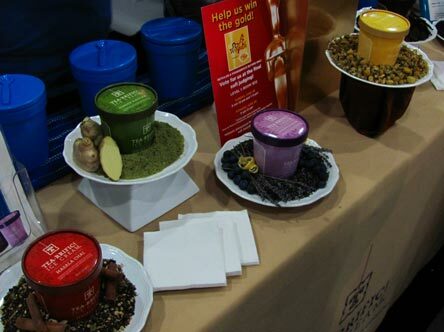 We sampled their Dark Chocolate Chili, Green Tea and a Roasted Banana flavor. The chili had a nice kick to it but not something that completely burned out your palate. The banana was perfectly ripe for me and one of the better banana flavors I've had. The green tea is something I won't comment on seeing as I hate tea for the most part. My girlfriend on the other hand loved it and it might've been her favorite bite of the show. She went to school in Okinawa, Japan and she said it was better than any green tea ice cream she had there. If that's not a ringing endorsement, than I don't know what is. Next up, we found ourselves in California with a booth shared by L. A. Creamery and Nancy's Fancy Gelato (Nancy herself was at the show). We sampled the L. A. Creamery Turtle Swirl flavor and oh man, was it good. Possibly the best caramel flavor of the day and the best turtle flavor I've had in my life. Don't worry about me not getting to try the gelato line. They actually sent me over 6 pints for free to review. Keep an eye out for those posts in the near future! Our New York friends, Steve's, was also at the show. Their Speculoos Cookie Butter flavor was up for a Sofi like I mentioned in my review and it ended up being the winner! 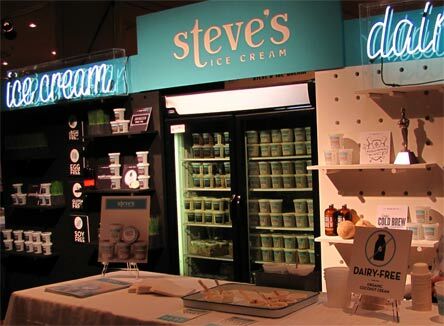 Congrats to everyone at Steve's, they truly deserved to win it with that flavor for sure. I sampled their Mexican Chocolate flavor and it had more of a kick than batches version. Steve's definitely doesn't mess around with their spice levels. I think I'd like to try a larger sample before I write it off for being too spicy though. Every other flavor they were sampling at the moment I had already tried. Still, their display was one of the best looking of the entire show. 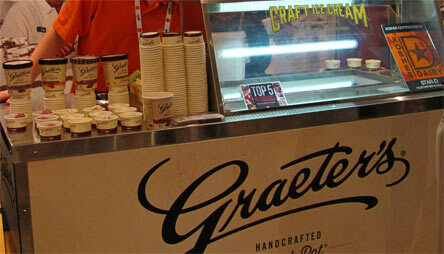 After Steve's it was another well known brand, Graeter's. I definitely spent the most time at this booth compared to all the other ones. When you get talking about ice cream, time just flies by. 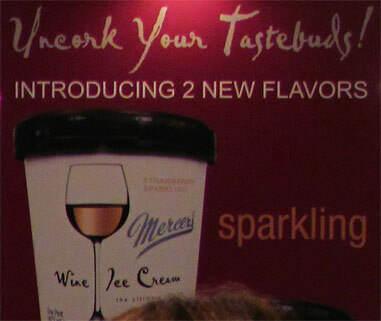 That and the marketing manager of Graeter's name is also Nick so we clicked for sure. They were sampling their black raspberry chocolate chip and bourbon pecan flavors but they also had some test flavors at the booth. One being a maple black walnut that was something I was not expecting to see at the show. Maple walnut flavors are going the way of the dinosaur it seems but what Graeter's is testing is something that could bring that flavor back. A nice subtle maple base with chunks of sweet, candied walnuts that are just ridiculously addictive. I want this in pints asap. They also were testing a reformulated banana chocolate chip flavor which is typically one of their seasonal flavors. I've never tried the original but I quite enjoyed this rendition. Perfectly ripe and complimented nicely by their signature chocolate chips. Weird, I'm normally not a fan of banana flavors but I went 2/3 at the show. That's pretty awesome to me. 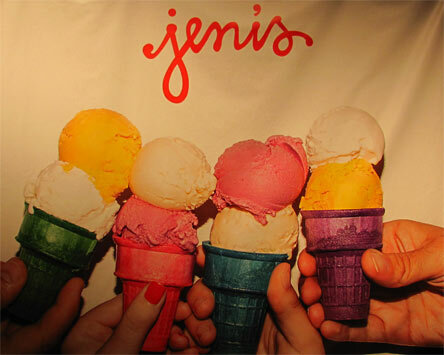 Next up was another Ohio big gun that's fallen on some hard times, Jeni's. They of course had no ice cream to sample but they did have their sauces at the booth. I was actually talking about their price structure with one of the guys at their booth and a lady interjected herself. I had a little discussion with her until something clicked in my head and I asked her name. Of course, it was Jeni herself and I felt a little disrespectful at that moment. She wasn't too fond of me in the beginning to be honest. That was until we kept talking and she realized I wasn't just your average consumer complaining about pricing. I feel like I earned a little respect from her and I hope the best for her company. While she couldn't give me a definite date for when they'll be back in stores, she's very positive about the brands recovery and time frame for being back into stores for all of your enjoyment. 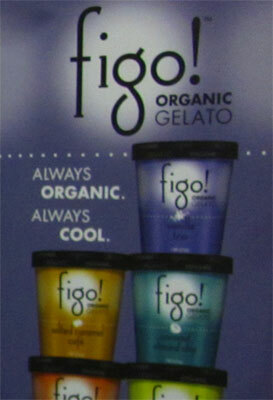 Figo Gelato brought us into Colorado if I remember correctly. 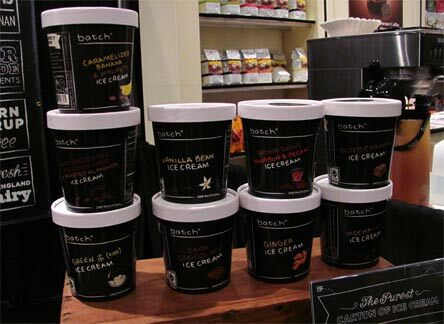 If you recall, I actually reviewed them for the site before under the Sorano Gelato name. Nothing has changed, just them rebranding themselves. I sampled the pistachio and it was more savory than I was expecting. It was good though, just not that butter cookie vibe I tend to find in other pistachio flavors I've had. I've seen Figo appear in my area more and more as of late so I'll have to grab a pint to review for the site sometime for sure. DF Mavens is a vegan brand that I've actually tried before going to the show but have yet to post reviews. 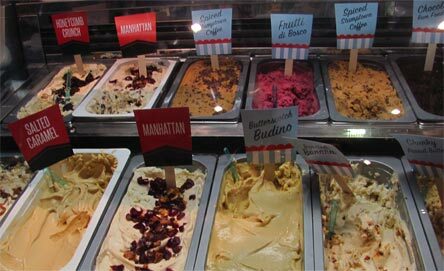 They actually opened up a scoop shop in the beginning of the year in NYC that I've been meaning to try out. If you're looking for a vegan frozen dessert, this is the brand for you. We tried their New Orleans Praline flavor and it tasted like a butter pecan with a slight kick. Definitely a nice change of pace and not very simple to tell that I was having a non-dairy product. I really need to post those reviews soon because this brand deserves the praise. I finally got to try McConnell's after basically being trolled by them for over a year. We sampled their Olive Oil & Almonds flavor and my thoughts on ice cream got completely changed. I thought I wouldn't want more than a small sample of this flavor but I could've ate a quart if given the opportunity. The hype is beyond real for this company. I now have connections with this company so expect reviews of their pints in the future. I know I won't be disappointed with whatever I get to try, that's for sure. 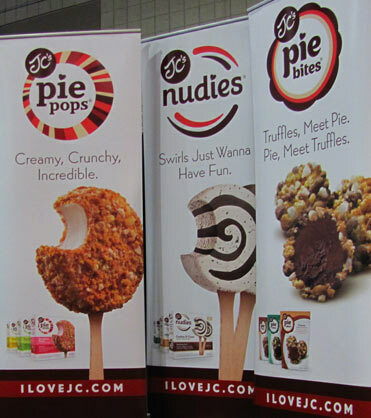 Another friend of the blog, JC's Pie Pops was also at the show. We've developed a real friendship over the years and I couldn't be more proud of all she has done. This year she was debuting her new Pie Bites which are shelf stable truffles with their cake coating. While not a frozen dessert, the s'mores version is worthy of a mention. She also had her new line of adorably named, Nudies, there. I tried the Salted Caramel and man was I impressed. For something that's only 110 calories, it sure as heck didn't taste like it. It was rich, sweet with just enough saltiness and not gummy or chewy like low calorie products tend to be. I need to try out the other new Nudies in the near future. There was another vegan frozen dessert company at the show, Coconut Bliss. I've seen them on the shelves but always passed them up because of my aversion to coconut. ‎Well safe to say, my gut feeling was right. I tried the chocolate hazelnut flavor and all I could taste was coconut and not in a good way either. Not likely I'll be reviewing this brand anytime soon. Coming off what I thought was going to be the worst bite of the show, we ended up in the Canadian section some how. 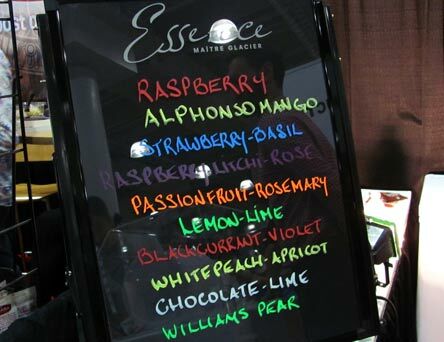 This brand called Essence was showcasing their ice cream or gelato, not too sure which one. It really doesn't matter because we tried three flavors and each one was worst than the last. And this is why Canada gets blamed for everything. Last up was our friends at Tea-rriffic. 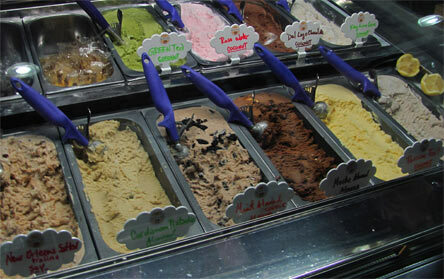 They had their whole line of tea infused ice creams available for sampling. I tried their Sofi Award Finalist and agreed with Dubba's review spot on. I could see it going perfectly with some granola. They also had a new Blueberry Lavender flavor. Seeing as I already spit out a sample in front of them once and also knowing I don't like Lavender, I left that sample to my girlfriend. She thought the two flavors went well together and that the blueberry could've been a little stronger. She even told me I wouldn't be fond of it after she tried it though. If it gets reviewed for the site, it won't be me doing it. Well there you have it, my first ever experience with the Summer Fancy Food Show. I'd like to thank all the companies I met with for being so kind to me and answering all my questions. I'd like to thank my girlfriend for letting me use her taste buds and stomach for the day. Also for keeping me on track and making sure I didn't walk completely by a bunch of booths like I almost did a few times. I'd like to also thank Dubba for letting me write for the site. Without him, I would've never of had such an opportunity to attend a show like this. Him putting his faith in me and his brand means the world to me. Last but not least, I'd like to thank all of you guys. Without you, On Second Scoop wouldn't exist. Thanks for supporting us day in and day out. Be sure to let me know your thoughts on the show and which brands you'd like to see on the blog in the future. Hope you enjoyed my experience and have yourself a great day. Cheers! Interesting that you actually spoke with Jeni. I wonder does she secretly reads your posts. Maybe that why she is little finckle with you? I hope you explained to the lovely Mrs. Jeni that it's not your fault that her prices are pocket gouging. Sounds like something she should fix...You know, and not shoot the messenger. I was wondering what McConnell's was after I spotted it at my local Fresh Market. It has taken the place of Jeni's (for now). I discovered McConnell"s about a month ago and I'm now addicted. My local Fresh Market carries about 6 or 7 flavors. I told the frozen foods manager if they ever stopped carrying these, I'd start a riot. Its pricey at $7.99 a pint, but I can't stop! LOVE the lemon and marionberry, olive oil and almonds, and salted cream and cookies. Those are my top 3. But they are all delicious!!! I think Jeni should have been much nicer. Between the listeria and the price, do you think she can bounce back? Based on those two factors, I wouldn't buy it. Alek, I highly doubt she reads the site to be honest. TTB, she was actually quite kind to me once she figured out I wasn't the average uneducated consumer bashing her prices. Anon #1, I have a feeling McConnell's will be keeping Jeni's spot for awhile and not surrendering it once Jeni's is back on shelves. Bulldoglover, I've heard great things about the two other flavors you have mentioned. I'd gladly pay $8 for McConnell's instead of $12 for Jeni's. Hopefully I'll get my hands on some more flavors in the near future. Anon #2, like I said, Jeni was nice to me once she realized I knew a lot more about ice cream than the average person. I feel like they will bounce back though. The brand has so much customer loyalty that I can't see them not coming back from the problems. I do feel like the price might go down though but that's just a gut feeling. I would presume Jeni's ingredient costs are going to be higher than most, and part of their appeal is actually the price. I'd be interested to hear more about the discussion though. Even an uneducated consumer has the intelligence to know when something is too expensive. Ohio, what happens at the fancy food show, sometimes has to stay at the fancy food show. TTB, not always. I mean there are still people who are uneducated and educated buying the products as well.